Should Nottingahmshire have a knock-out County Cup cricket competition? Saturday’s spectacular win at West Indian Cavaliers was a wonderful experience and a result that very much keeps us in the hunt for the Nottinghamshire Premier League title. More than that though, it was a demonstration of how exciting and thrilling a game can be when both teams need to win in the closing stages of the season. Up until only two or three weeks ago, up to six or seven sides could have retained realistic hopes of winning the title. As a result, there have been some surprises and a number of twists as teams fought it out for vital points. When league cricket is like this it is great. Too often though, the second half of the season can be a dull affair for five of six teams stuck in the middle of a league, where there is a two horse race for the title and perhaps a three horse race for relegation. Growing up in Lancashire this could also be a problem. In fact, in the Northern League there was no relegation. However, what we did have was places in the Lancashire Cup to play for. You could equate this to qualification for next year’s Champions League. 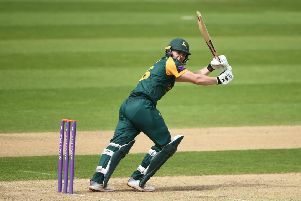 The top four teams in the league at the end of the season qualified for the Lancashire Knock-out Cup, which was made up of similar qualifying teams from around the various leagues in the county. This was then (and still is) a really tough competition, which was hotly contested and with a final at Old Trafford. I still find it a great shame that Nottinghamshire does not have a county cup competition. Yes there is the T20, but as I have stated before, I really think this could be scaled up, and it is not comparable to a longer format competition. It would be great to have a 40 over or 45 over cup competition, which the top seven sides from the previous Premier League season (plus the T20 winners) qualify for. They could then be joined by the top four finishing sides in both the South Notts Division A and the Bassetlaw Championship to make a 16 team knock-out cup. You would then actually only need four rounds, and it could be a cup competition to run towards the second half of the season after running the T20 during the first half. One of the key elements would need to be a Trent Bridge final. For local cricketers, this should be seen as a great opportunity to play at an international venue, and something to aspire to. I find it most disappointing that local club cricketers are not currently afforded this opportunity. Thankfully, there are no dead rubbers ahead for ourselves over the next three weeks, and we must be on top of our game as we face a tough Farnsfield side this coming weekend.